Your jaw actually has two hinges that are called TMJ, or temporomandibular joints. They are located right next to your ears, and they are what allow you to move your mouth fluidly whenever you eat, speak, laugh, or smile. Sometimes, whether because of stress or injury, these joints can become misaligned and cause a wide variety of issues that are generally referred to as TMD, or temporomandibular joint disorder. If you suffer from a stiff or painful jaw, chronic headaches, or neck and shoulder pain, read on below to learn more about this condition and how we can help. Some TMD patients even suffer from back pain because of this condition! If you are experiencing any of these symptoms, you can get a proper diagnosis from Dr. Jerry Bock. 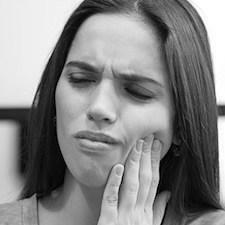 He’ll test your jaw’s range of motion, and if you do indeed have TMD, he can recommend a variety of treatments. If it is likely caused by stress, we may suggest that you actively stretch and relax your jaw muscles during the day or apply heat right before you go to bed. 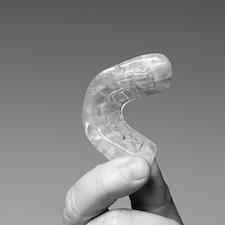 If the condition is a little more complicated, we may choose to utilize something called an occlusal splint. An occlusal splint is an orthotic device that is used to help realign the muscles and joints of the jaw in order to relieve the symptoms of TMD. It is a small, custom-made mouthpiece that you’ll only need to wear to bed, and it’ll help position your jaw into a much more relaxed and natural orientation. After a few months, many patients can stop wearing the device, but for some, they may have to continue to keep seeing results. 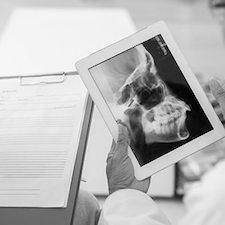 If your jaw is constantly sore or if you’re suffering from chronic pain and can’t figure out why, TMD may just be the culprit. To start getting relief today, please contact us to make an appointment.